The initial purchase price of the equipment is just one small part of the total life-cycle cost of fans and pumps. 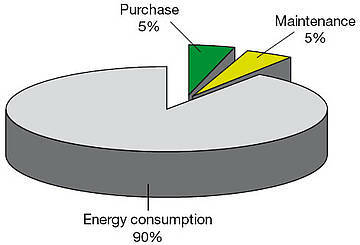 Maintenance is a significant cost, but the majority of operating costs come from energy consumed. The Fig. represents the typical life-cycle costs of a pump. It shows that energy savings of up to 70% can have substantial effect on the cost-of-pump ownership. For fans, the typical life-cycle costs are very similar to those shown for pumps. Most electric motors used in HVAC and water applications are "squirrel cage" motors, also called induction or asynchronous motors. Their popularity is due to their reasonable price, low maintenance costs and reliability. The only way to control the motor's speed is to change the frequency of the alternating current (AC) power in the input: this is where frequency inverter comes into the picture. A frequency inverter is known by many names, such as variable frequency drive, frequency converter or adjustable speed drive. All mean essentially the same thing: an electronic device that provides stepless speed control in an electric motor. However, today's frequency inverters also feature other functionality, including control and protection to other equipment in the system. Throttling control with dampers or valves. Using inlet vanes in centrifugal fans to restrict the flow of air into a fan. Using fluid or eddy current couplings to control the torque between the fan and the motor. Pitch adjustment with axial fans, where the angle of the fan blades is altered to change the flow. 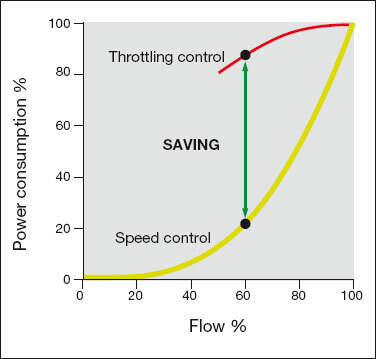 The downside of traditional flow control is that none directly affects the main power consumer. There are possibilities to decrease the power consumption of some of these components, but none are as effective in energy efficiency as using speed control with a frequency inverter. For example On/Off control will generate much mechanical stress and pressure peaks due to both the extra starts and stops and the current peaks into the electrical supply when the motor is started without the use of frequency inverter. As previously demonstrated, the savings from using frequency inverters should be considered when evaluating costs and payback times. CentraLine fan and pump savings calculators can assist in estimating the savings created by investment in frequency inverters. The calculators use the most typical traditional control methods, such as damper and vane control for fans or valves and on/off control for pumps, as the basis of comparison. The Fig. shows the starting view of the CentraLine fan savings calculator. The example shows a savings calculation for a typical 5.5 kW centrifugal fan in air handling application comparing throttling control with dampers and the speed control with CentraLine frequency inverter. Gas input data: In HVAC application these can be left as default values since dealing with circulation of air. 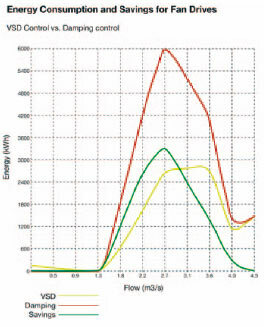 Fan data: Nominal volume flow and rated pressure increase can be obtained from the fan datasheet. - If possible, use real values; otherwise, default values give good estimations. - The fan in question is a direct-driven fan so transmission efficiency is 1. - CentraLine frequency inverters are typically as high as 0.98 efficient. Energy price should be the real price to provide the most accurate estimates. Hours of use per year are always estimated. This calculation assumes 80% use per year with typical operating cycles for air handling application. The cost difference in this calculation is an estimated price difference for this size of frequency inverter and damper system investment. The results reveal annual savings in energy cost of 992 euros and a payback time of 0.65 years for the frequency inverter investment. Here is shown a rough calculation comparing the investment of direct online connected and frequency inverter controlled pump system. Using frequency inverters in speed control of flow devices, such as pumps, fans and compressors, is not a new innovation. However, the new technology in these devices has made them even more attractive, due to their lower cost. There is much potential to save energy by using more variable-frequency control for electrical motors in HVAC systems. The technology will be a major contributor in meeting the demands from local and international agreements and norms for energy savings and for lower CO2 emissions.